Today is Christmas in western hemisphere and the Birthday of Amitabha Buddha in eastern hemisphere according to Chinese Buddhist tradition. Disciple Kai Xin came out from a seven-day retreat today. And during the retreat Kai Xin was inspired to compose the attached praise. I had revised it. The revised file attached. 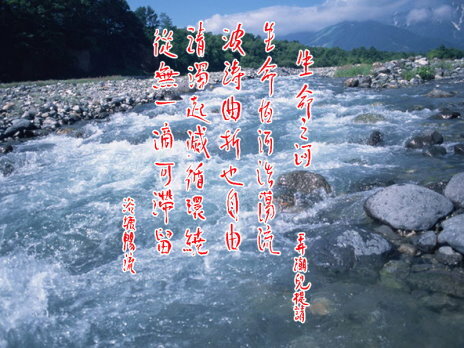 In addition, Kai Xin had asked a musician to compose a song using my poem, The River of Lives, as its lyric. And the musician had also asked a singer to sing the song. It is also ready today for all to enjoy. I will release the music score and the mp3 file soon. Right now just waiting for fixing a typo. It is so wonderful to be able to offer to all these two works on such an auspicious day! With waves rising and twisting at liberty and at will. Never is there a drop that could linger despite the stream. Birth and death of sentient beings, motion and rest of lives are like the surging of a great river. Engaging in Dharma services is like a ferryman streaming down the river to render help constantly and unobtrusively. Thus the practitioner becomes part of the great river of lives, and is no longer bound by worldly considerations.